Neapolis University in Cyprus, amongst all universities in Cyprus, showcases flourishing activity in the number of publications authored by its personnel. Publications can be found on HEPHAESTUS, the Institutional Repository of the University. HEPHAESTUS is an open source institutional repository which gathers all the digital material of Neapolis University’s various activities, particularly original research studies produced by the members of the University. The HEPHAESTUS Repository demonstrates the intellectual life, research activities and publications of the University, preserving, acknowledging and promoting scientific research to benefit the local and international community. Ιn the context of the research project “InHerT: Promoting Cultural Heritage as a Generator of Sustainable Development” Dr. Ioannis A. Pissourios and Mr. Michalis Sioulas, researchers and faculty members of the Neapolis University in Cyprus , edited the handbook “Cultural Heritage & Sustainable Development. An Educator’s Handbook “, which was funded by the program and is the result of collective work and intellectual outputs of the InHeriT program. 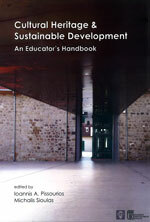 This handbook is a tool for Cultural Heritage & Sustainable Development seminars, but it can also be the main bibliography for relevant studies at graduate or postgraduate level. The partners of the InHeriT project that collaborated for this handbook are the School of Architecture at the Technical University of Crete, Greece, the Department of Economics at the University of Athens, Greece, the Department of Economics of Middlesex University (United Kingdom), the Maniatakeion Foundation in Greece, the School of Architecture of Neapolis University Paphos, the Center for Architecture of the Mediterranean in Chania, Greece and the foundation Fondazione Flaminia in Bologna, Italy.